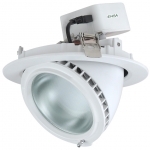 The ENSA™ premium range of adjustable and fixed LED downlights feature the best in light output, service life, colour rendering accuracy and more. Available in cool and warm white, these downlights utilise high quality Samsung LEDs to provide a minimum of 92lm/W luminous efficacy and up to 50,000 hours rated LED lifespan. Each adjustable downlight can tilt up to 60° making these lights perfect for versatile spot or key lighting in retail spaces, showrooms, foyers, office environments and more. 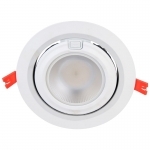 The fixed downlights have a wide 100° beam angle and circular light distribution, designed to provide evenly distributed, high quality light perfect for general purpose illumination in store fit-outs, galleries, residential and office environments and more.